For over two years, an old office in Derby had been left empty and lifeless but is now the centre of the hustle and bustle. This is due to the fact that it is now home to Derby University’s Law and Criminology Department. It is a building which cannot be missed as it is such a distinctive, beautiful and abnormal colour. It is a six storey, 32,000 square foot expanse with an exterior of copper plating. Originally, it was built as office in order to create around 700 jobs, as a £20 million project, but this architectural beauty, now named, One Friar Gate Square, failed to attract the businesses it was intended for. 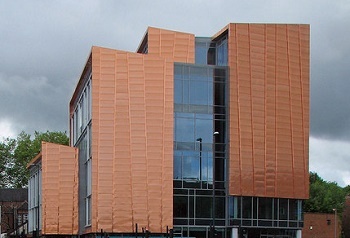 The intended space had to be changed so that the layout was amenable and usable for the university staff and students, so it now has a number of specialist rooms relating to Law and Criminology, including an open plan specialist law library, lecture theatres and two fully compliant Court rooms Magistrates and Family Court – and all of this is inside a shell of copper plating! Copper plating is both functional and aesthetically pleasing. Copper plating is very bright and eye catching. It has excellent levelling properties, naturally kills bacteria and is often used for decorative purposes, such as the Derby University building. Copper plating has a smart, polished copper-pink finish and can be lacquered to prevent tarnish from occurring. Closed-loop water cooling kits are often used in computers or gaming PCs but do not have the greatest of reputations when it comes to safety, though they may be convenient. Instead, enthusiast are using custom kits due to their performance and the fact that they can customize them to be just as they need them to be. The new Thermaltake Pacific R360 D5 water cooling kit seems to be a great hit so far this year, because it has everything enthusiast builders need, and everything is all in one box! Three Ring 12 LED blue radiator fans – hydraulic bearing and anti-vibration mounting system. This also aids the aesthetics as well as make the cooler quiet. Extra accessories – often ordered extras to improve the external appearance of the water cooling kit. What does Nickel Plating do? The CPU water block has a base made out of copper and anti-corrosive nickel plating. What does nickel plating do to help? 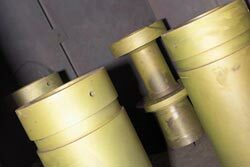 Due to it being so corrosion resistant, its life is drastically extended, which means that part replacement occurs much less frequently than with other coating types, materials or if left uncoated. Rust is unable to form where nickel plating has occurred and therefore the quality of the components is improved. Nickel plating is great because it deposits itself evenly over a surface which not only looks nicer aesthetically, but it also makes the component a lot more durable and hard wearing. Nickel plating is the perfect solution for components which a subjected to a high amount of friction, wear or use and if it is treated properly, with the appropriate heat treatment, it will not chip or flake either like a top coat of paint or lacquer does. Due to inspirational Physics developments, it is now possible for astronauts to drink Whisky in Space. The activity of visiting to space may be a dangerous one but at the end of each day, the astronauts can rest easy when they are assured that they can have a ‘real’ drink, which isn’t out of a plastic bag. Apparently, this is one of the most common complaints from the International Space Station (ISS) crews that they miss their familiar Earth-like environment back home. On hearing this, Ballatine’s therefore addressed this by commissioning an Open Space Agency team, led by James Parr, in order to create an innovative, microgravity glass which would enable the astronauts in question to enjoy a glass of whisky, just as they would with their feet on the Earth. Ballatine’s Space Glass looks like a regular whisky glass but has special, particular features allowing liquid to enter the glass, stay in the glass and which allow sipping. It has been studied for over a year as to how whisky behaves in a zero gravity environment by building a series of prototype glasses to test their theories. The final result is something that somewhat resembles a Don Draper balloon glass but which is made out of 3D printed plastic and has a weighted rose-gold plated spiral convex base which sits perfectly in the holders hand. Its weight comes from the 10kg pull magnet, giving the glass some inertia, anchoring it to the table when in zero gravity. The base also contains a clever, one-way valve to fill the glass using a standard Ballantine’s whisky bottle, in order to stop the whisky from spilling. The reason as to why the Space Glass has been gold plated was partly due to the aesthetics with the gold plating matching the plating used on the astronauts’ sun visors on their spacesuits. But the gold plating was also used because it is one of the very few metals which does not affect the taste of the whisky when in Space. How does Gold Plating help drinking in Space? When liquids are in Space, they tend to turn in to a sticky jelly, so to counteract this from happening with the whisky, a spiral in the glass creates surface tension which holds it down. The side of the glass contains a helix with a small channel concealed inside it which picks up the whisky in a capillary action, pulling it up to a gold plated mouthpiece on the rim of the glass. Why a gold plated mouth piece you may well ask? This is for multiple reasons – Firstly, so that the astronaut can physically see where their lips are meant to be placed so that they are over the concealed channel exit point and they know where to put their lips. Secondly, the gold cools the alcohol as it passes through the mouthpiece. Thirdly, gold plating and not metal plating of any other kind, means that there is no nasty after taste left in the mouth of the drinker and the texture of drinking out of what (at the end of the day) is a plastic beaker, is concealed.